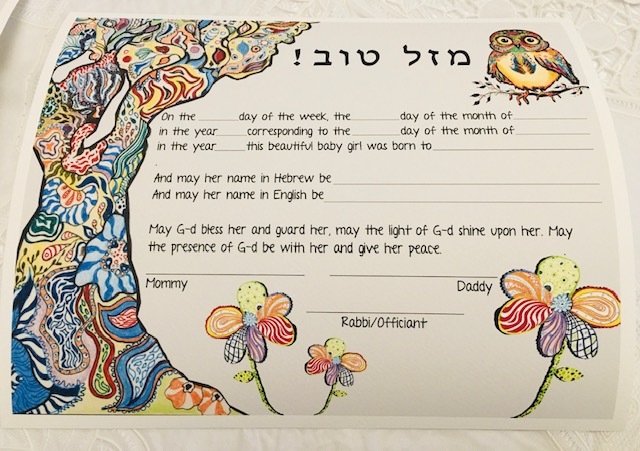 Here is a lovely example of a Jewish baby naming certificate. We signed this along with a Christian baptismal certificate for this interfaith family. Each family makes their own choices. Some of my families choose to have one general baby blessing certificate or a customized certificate that unifies the two religions. This family chose to have two certificates. For interfaith families, my message is that there are more options than you know! Melissa Grieves on Happy Valentine’s Day! Melissa Grieves on Thank you all for celebrating BLESS THIS CHILD, A COMPREHENSIVE GUIDE TO CREATING BABY BLESSING CEREMONIES with me! Nancy Xenakis on Book Launch Party for Bless This Child at Landmark on the Park! Melissa Grieves on Book Launch Party for Bless This Child at Landmark on the Park!